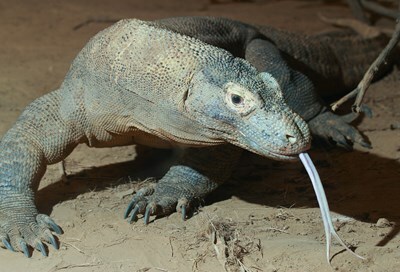 The Komodo dragon (Varanus komodoensis), also known as the Komodo monitor, is a large species of lizard found in the Indonesian islands of Komodo, Rinca, Flores, Gili Motang and Padar. A member of the monitor lizard family, it is the largest living species of lizard, growing to a maximum length of 3 metres (10 ft) in rare cases and weighing up to around 70 kilograms (150 lb). This description uses material from the Wikipedia article on Komodo dragon and is licensed under the Creative Commons Attribution-ShareAlike License (view authors).